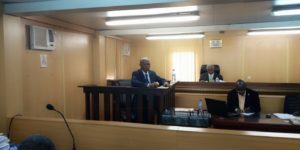 The Chief Accountant at the Ministry of Agriculture, Forestry and Food Security, Edward Bassy Kamara, has told the Commission of Inquiry presided over by Justice Bankole Thompson that since he started working in 2009, he was never aware about a certain bank account at Ecobank until 3rd December, 2015. He told the commission that the said bank account was controlled by the then Permanent Secretary, one Edward Martin Kargbo, who was also in possession of the cheques. Led in evidence in chief by State Counsel, Robert B. Kowa, the witness told the commission that he has been working in the ministry for about nine years now, and that his responsibilities include writing of payment vouchers, Public Expenditure Tracking Survey (PETS), commitment forms and cheques. Lawyer Kowa referred the witness to the Performance Audit Report on the management of the fertilizer scheme by the ministry. He also read the management response by the Permanent Secretary, which stated that the principal Accountant and Director of Crops and Extension could not provide response to the Auditor General during the auditing process. On the secrete account, he told the commission that the account was referred to as RCPRP, ASRAP, OFTN and FFS, adding that it was never to his knowledge as to why it was latter referred to as fertilizer account. He said the signatories to the said account were the Permanent Secretary, the then professional Head, Francis Abdul Rahaman Sankoh, and one E.K Bangura- Director of Crops and Extension. He added that he became one of the signatories on 3rd December, 2015, when the Permanent Secretary handed over two cheque books of the account to him. He said the management response in page 46 of the audit report did not indicate any supporting document in respect of the cheques issued, noting that he had signed few of those cheques from 3rd December 2015 to 17th February, 2016. He said procedures of issuing cheques in the ministry depend exclusively on how the account was opened. He said that whenever an account of such is opened, names of people will be given as signatories, but couldn’t tell as to who were the initial signatories to the account because it was long in operation before he started working at the ministry. He said the Permanent Secretary was given the powers to appoint someone to be a signatory to an account, but that it was also mandatory for the Chief Accountant at the ministry to be part of the signatories. He said he has supporting documents of the cheques he had signed that were currently kept in the store at Kissy, noting that he never provided response to the Auditor General’s Report because he was not aware about the said account at that time. He noted that he could only account for the few cheques he had signed from 3rd December, 2015 and February, 17, 2016. He confirmed that the Permanent Secretary called and informed him about the account after the then minister had asked him to do so.